Probably almost everyone has heard of The Three Musketeers. And, no, I'm not referring to the candy bar. I'm talking about the 1844 novel of the same name by Alexandre Dumas père, which has spawned over twenty film adaptations and thirteen animated adaptations. My favorite Three Musketeer movie is the 1973 film directed by Richard Lester and starred Oliver Reed, Frank Finlay, Richard Chamberlain, and Michael York. Two sequels, The Fourth Musketeer and The Return of the Musketeers, were later made. 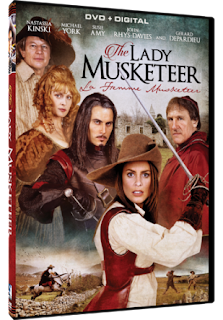 Michael York played Jacques d'Artagnan in those three films and would later reprise the character for the 2004 miniseries The Lady Musketeer (La Femme Musketeer), which was released to DVD + Digital from Mill Creek Entertainment earlier this year. Valentine D'Artagnan, Jacques' daughter, traveling to Paris to become a musketeer. Thanks to an introduction letter written by her father, she is easily accepted as a new recruit by Commander Finot (played Roy Dotrice). However, due to her gender, the original three musketeer son's (Etienne Aramis, Antoine Porthos, and Gaston Athos) aren't as accepting. A woman has never been titled a "swordsman," so Valentine must prove to everyone that she is just as good as her father. While this isn't the first time there has been a reboot of the The Three Musketeers story, it's the first time a returning actor (Michael York) has reprised a role from previous adaptations. At first glance, The Lady Musketeer looks like a fun new version of the classic tale, but unfortunately that isn't the case for the two-part miniseries. The directing and overall cinematography is horrible. There are way too many slow-motion moments during the action scenes which made it difficult for me to actually enjoy what was occurring on the screen. The acting ranges from good to really bad, and the campy dialogue made everything worse. The picture and sound quality are decent for a DVD, thought it could have been better. There are no special features or extras. It does come with a digital code that can me redeemed on the Mill Creek Entertainment's website. Overall, I was disappointed with The Lady Musketeer. It was great seeing Michael York playing D'Artagnan again, but it would have been nice if the miniseries had a better script, a bigger budget, and a talented director.